So I’ve showed you now two excellent exercises for the abdominal region–plank pose and abdominal crunches–and hopefully you’ve been doing them, getting sore…but getting stronger too. I would now love to share a phenomenal exercise for the lower abdominals (abs). 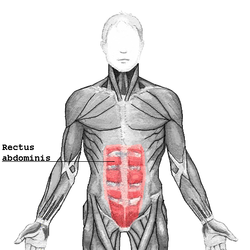 Although the rectus abdominus is one muscle, we often discuss it in terms of being split into upper and lower sections. So for our purposes here here, we’ll consider the lower abs as the abdominal from the belt line down to the pubic bone. As a sports chiropractor in iron-pumping West Hollywood, I see lots of body builders with low back pain. Now many of them seem perplexed that being in such “great shape” they should have low back pain, but sometimes things we do regularly that don’t seem to be a problem while doing them, actually end up creating problems for us after the fact. Tight hip flexors due to poor low abdominal exercises is one such thing. When the hip flexors (and I’m primarily talking about the psoas major here) get tight, they can cause low back pain. I find that a popular exercise for the lower abs–leg lifts–is a primary offender. These hip flexor killers stress the psoas major muscle, which can be felt almost immediately as pain and soreness in the anterior, or front, pelvic/groin region. I do not recommend leg lifts for most people, as more people than not have tight or hypertonic psoas muscles. However, saying that, some people do have weak hip flexors and can use strengthening, but again, it’s not the norm. If uncertain, please visit your local West Hollywood sports chiropractor for an evaluation. Watch the video below to learn what I consider the best lower abs exercises. I will also demonstrate the popular leg lift exercises, and explain exactly how they stress the hip flexors, and what you can do to modify even these to get a great lower ab workout. Oh boy, here we go…so you know that I’m not shy about discussing my health. I’ve got nothing to hide, and I approach my health from a very proactive position. I also have a belief system that is integral to how I care for my health—I know that one day I am going to die, could be tomorrow, but for me to experience my life to the fullest today, I am quite certain that it requires me to care for my body as one of my most valuable assets. So I don’t obsess about “never getting sick,” I just treat my body like I love it, and I trust that it knows—through its innate intelligence–how to run my body, provided I treat it in the right ways. Simple. So long-time readers of this blog will recall that I have high cholesterol. Have I ever been worried about it? No, never. Not even a little. In fact, I just had my annual physical in February. 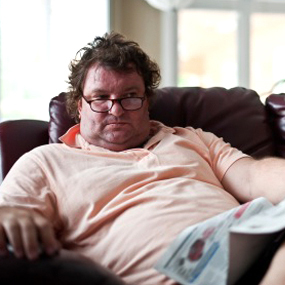 Once again, stellar health, thank you, thank you…athlete’s numbers…’cept I have high cholesterol. If you’ve been following my story, you’ll recall that my doc (love him, bless his heart…and I mean that sincerely; he is the greatest) has, of course, recommended I go on statins. Now I’ve got my inner theories about it, regarding liability and stuff like that, but whatever…he knows I’m not going to take them. 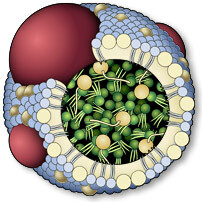 It’s simple: my HDL levels (“good” cholesterol) are above and beyond excellent. My total cholesterol to HDL ratio is at the “optimum” level. Ha ha ha…I’m in the absolute lowest risk category for heart disease: I’m not taking statins! Okay, here’s the point of this piece: A recent study has shown that low levels of LDL (“bad”) cholesterol, in the absence of cholesterol lowering medications, has a strong link to cancer. What?! That’s right, and although we’ve known of this link for a long time (30+ years), this study was the first ever look at the low LDL-cancer link over an extended period of time (~19 years), and only in patients with no history of taking cholesterol-lowering drugs. The results showed a couple things. One, the link cannot be due to taking statins since all subjects were statin-free throughout the study, and two, low cholesterol cannot be a byproduct of the cancer itself, since low LDL levels were observed well before any preclinical signs of cancer were present. In other words, statins don’t cause cancer, and cancer doesn’t cause low cholesterol. That we know. What we don’t know is what the connection is. Hmmm…. Well let me give it a try: I believe that the body has an internal wisdom, an Innate Intelligence, that directs its operation. I believe this system is flawless. 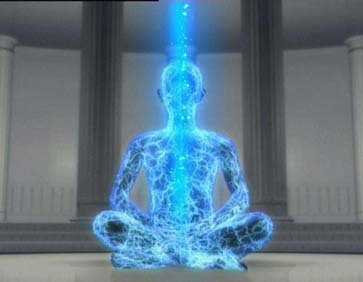 The body knows what to do at all times, and provided with the right fuel (whole, natural foods), necessary movement, proper bodywork and tension relief, adequate rest, adequate hydration, full, deep abdominal breath and minimal toxins, it will continue to operate flawlessly until it expires (which it will also do flawlessly). 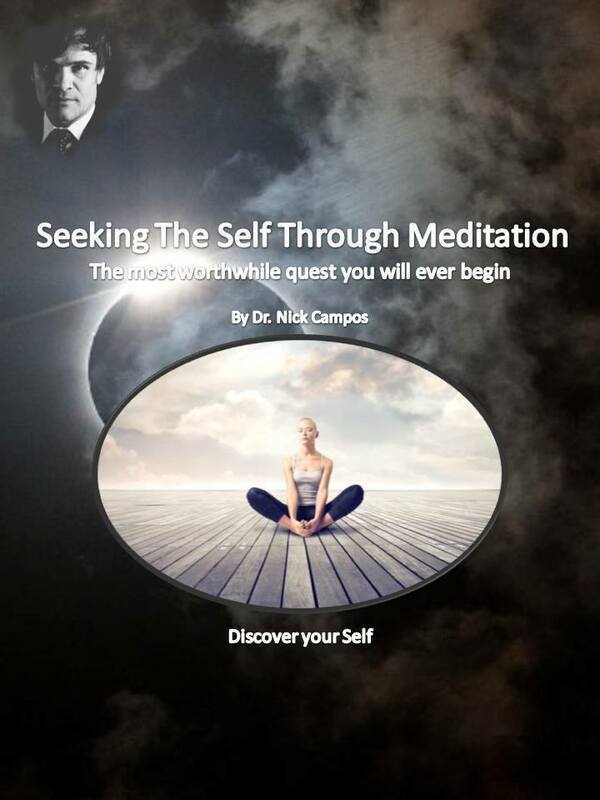 However, too many people do not observe the natural laws of health—they eat poorly, fail to exercise regularly, ignore bodywork until they are in so much pain they can’t stand it, get little rest, drink too many sodas and not enough water, breathe shallowly from their chest, and take multiple drugs and other toxins, and so, yeah…their Innate Intelligence get severely challenged and fatigued; or it can only do the minimum with the resources it is given and becomes overloaded. Further, we have a medical science that believes its own limited observations are the whole to the puzzle, and it make erroneous conclusions based on this small, piece-wise information, and yet it still believes it knows how to run the body better than Mother Nature does. And then we find out later that there is, in fact, more to the puzzle. You don’t say…? But taking all the above points into consideration: Somehow when LDL cholesterol is disrupted from one of its many functions—that is, when it’s in too low of concentration—leads to cell overgrowth or cancer. Thus, not that statins, by lowering cholesterol, will cause cancer, but instead, perhaps this medical campaign to reduce cholesterol at all costs is an erroneous one. Perhaps the body produces what it needs (cholesterol can be both endogenous [created within] and exogenous [recieved from without]), and putting everybody on statins, particularly those with stellar numbers in all other health measurements, is just plain foolish. No medical doctor or pharmaceutical researcher will ever know human physiology better than the human body does. Why the arrogant medical scientific (?) machine believes that it understands what cholesterol levels should be better than the body does is completely perplexing to me. If we were simply talking about a few hundred thousand people on statins because they have super-dangerously high levels that puts them at severe risk of heart disease, then…okay, I would understand. But to have tens of millions of Americans on these useless and dangerous cholesterol lowering drugs is purely idiotic. 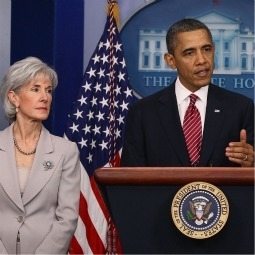 So once again I have to believe it all comes down to three things–money (pharmaceuticals), liability (doctors protecting their asses) and job protection (medical professionals making sure they do not become obsolete). That’s the reality behind the cholesterol-statin push in the western world. I’m sure that’s why my doctor recommends statins to me despite my excellent health, I’m sure it’s why statins are called “the best selling drugs of all time,” and I’m sure it will continue until the next blockbuster drug addressing normal physiology comes along to take it’s place. Shouldn’t be too far off—stay tuned. That’s right, millions of you reading this will be taking this drug in the very near future. Or maybe it’s 2022, and you’ve been taking the drug for the last few years. Either way, AMG 145 will be the newest wave in the medical industry’s fight against cholesterol. AMG 145 is a fully human monoclonal antibody to Proprotein Convertase Subtilisin/Kexin Type 9 (PCSK9), a negative regulator of the low-density lipoprotein receptor. 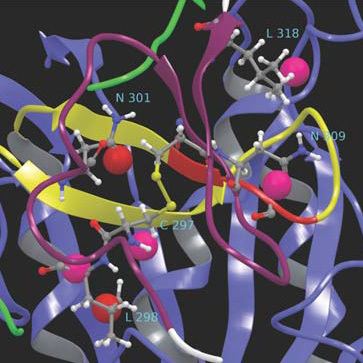 A recent study shows AMG 145 reduces PCSK9 activity, a protein that reduces the liver’s ability to remove LDL or “bad” cholesterol from the blood. Less PCSK9 = more LDL removal by liver. AMG 145 is called a PCSK9 inhibitor. The early phase 1 trial was conducted to test the safety of AMG 145. 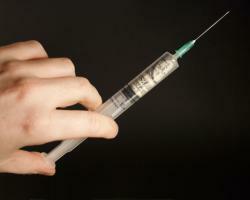 Researchers followed 51 patients who received a shot either once every two or four weeks. They found that some subjects, those already taking high dose statins (popular prescription cholesterol lowering drug), had an average of 63% reduction of their LDL levels. And those on a low dose statin regimen fared even better, with an average 66% reduction of LDLs. Manufacturer Amgen is rather pleased with the results, and why not? A drug of this magnitude has the promise of dominating a market for ten plus years. 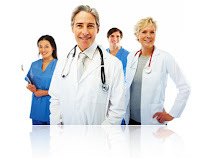 I am certain that medical doctors, administrators, federal overseers and the mass medical marketing machine are also ecstatic, as this can darn-near guarantee a “good” decade for medical business interests. 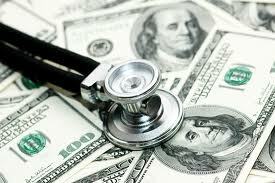 Industry analysts says PCSK9 inhibitors, if approved, could generate annual sales approaching $20 billion. Although insiders caution that bigger trial are needed, they do hope a technicality can get AMG 145 through the U.S. Food and Drug Administration (FDA) hoops and approved for sale. A big question remaining is whether U.S. regulators would approve the drugs without first requiring major studies that evaluate long-term heart attack and stroke risk. “That’s the subtle wrinkle here,” said Steven Nissen, head of cardiology at the Cleveland Clinic. He speculates that the FDA might be willing to approve them without such costly outcomes trials because statins were approved without them on the basis of their ability to lower cholesterol. Nice to know. 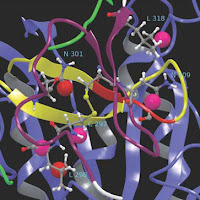 Because both statins and the PCSK9 inhibitors, although different classes of medicines, exert their influence on the LDL receptor–a protein that carries LDL cholesterol through the bloodstream–Nissen thinks that it might be enough to construe a similarity argument, getting it passed through the FDA without necessitating additional testing. Just another day at the office for Big Pharma. I would love to share some interesting, if not telling, “health” statistics with you. Remember from an earlier post that most people in western society use the term health care to describe medical care, but I’ll let you decide how to define things. A big thank you to Don Petersen and Dynamic Chiropractic for alerting me to these numbers. 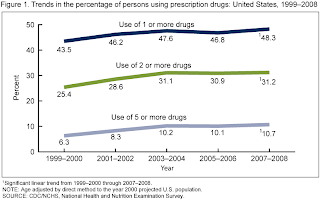 According to the Centers for Disease Control and Prevention, National Center for Health Statistics study published in September 2011, the percentage of Americans on prescription drugs in a given month has risen from 39.1 percent (1988-94) to 47.2 percent (2005-08). 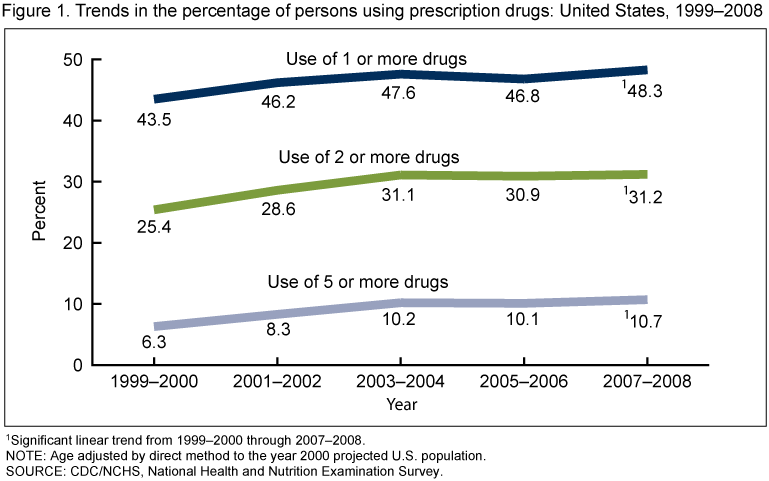 So nearly half of all Americans are on at least one prescription drug! 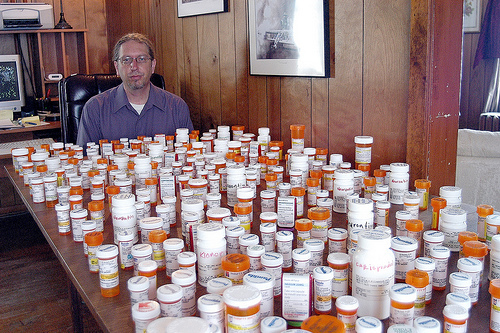 20.8% of all people are on three or more prescription drugs. 11 % of all people are on five or more prescription drugs. 25.3% of children and teens (under the age of 18) are on at least one prescription drug. 52.4% of all women are on at least one prescription drug. 90.1% of seniors (ages 65 and older) are on at least one prescription drug. 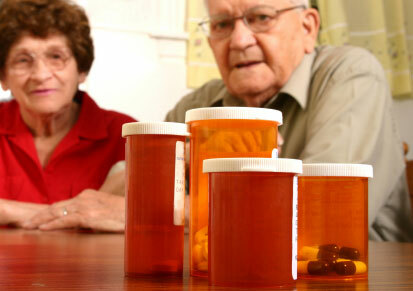 65% of seniors are on three or more prescription drugs. 36.7% of seniors are on five or more prescription drugs. Nice! And which drugs are Americans popping like Pez? Children (under 12 years of age): asthma (5.7% of children are taking prescription drugs for this), asthma/allergies (3.9% of children), infections (3.7% of children). 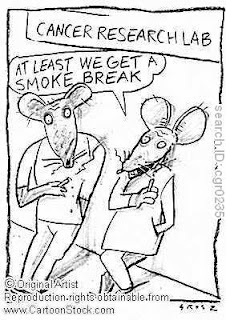 Teens (ages 12-19): attention deficit disorder (6.1%), asthma (5.4%), antidepressants (4.8%). Adults (ages 20-59): antidepressants (10.8%), pain relief (10.1%), cholesterol-lowering drugs (8.4%). Seniors (60+ years): cholesterol-lowering drugs (44.9%), beta-blockers (26.4%), diuretics (19.9%). A couple of thoughts before directing you to Don Petersen’s Dynamic Chiropractic video explaining these recent findings. First, let me address the bright side: There are still ~10% of older Americans (ages 65 and older) on NO drugs! That’s a darn-near miracle considering the massive pressure older people are on to take medications from their doctors, the mass media propaganda, and the inevitable aches, pains and illnesses they encounter (like we all do). Second, although about half of all Americans are on one medication or another, half are not. Yes, I believe that medications are useful and necessary under certain circumstances, but these numbers tell me that either Americans are sicker than ever before in history (a distinct possibility considering the foods they routinely eat, the amount of soda they ingest, and how many drugs they currently take), OR they are just so indoctrinated by the the medical “health” paradigm that to the American psyche this is health. In any case, 50% of all Americans are drug free in any given month, so they are experiencing, and hopefully, caring for their health. I guess in today’s pharmaceutical climate that’s something to be grateful for. Watch the video below to get more of an understanding on the current medication stats–forgive me, health stats–for Americans in 2012. How do Madagascar hissing cockroaches soaked in whiskey with a hint of citrus sound as an appetizer? Python patties with applewood smoked bacon? How about stir-fried jellyfish, or scorpions, or alligator; how about kangaroo? One NY chef thinks this is the food of the future. And why not? As the planet’s resources dwindle beneath the pressures of an ever-booming population, we may be forced to dine on these arthropodic–and other exotic–delicacies. Chef Gene Rurka is serving just these dishes at the famed Explorers Club annual dinner held at the Waldorf-Astoria in New York City tonight. The black-tie affair hosts world explorers, modern-day adventurers and their wealthy patrons. 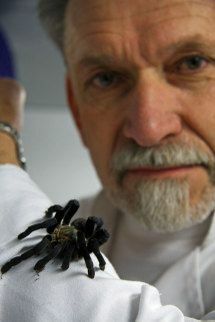 More than a few guests have climbed Mount Everest, walked on the moon, and visited the deepest depths of the ocean–a small entrance requirement necessary to indulge in tarantula fritters. Rurka believes his dishes represent the food of the future. He points out that not only may it become a future necessity, but that insects and other exotic fare are already common foods in many cultures. True that. And chef believes that it’s all in the presentation anyway. He uses a distinct method to ensure that the roaches look alive as they are served, by freezing them to death; then he soaks them in whiskey to bring them back to room temperature. 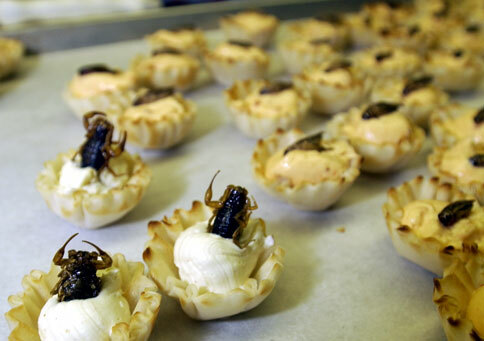 He then injects them with Tasmanian leatherwood honey and a bit of soy sauce for a sweet-salty kick. Nice. Hey, who can argue with that? Watch the video below to enjoy some of chef Rurka’s concoctions. I especially enjoy the woman who proclaims, “I just had the pork testicles, cooked in blood.” Right. Bon Appetit. I love this product: Intelliskin PostureCue Performance Apparel is sportswear that improves posture and athletic performance by positioning your frame into the most biomechanically correct alignment. As a result, your body has a greater chance to heal from injuries, and it develops in proper accordance with your specific sport. Now that’s something to get excited about. The shirt is made of 56% nylon and 46% Lycra and is a compression fabric, so it fits snugly, but also expands elastically. It has posture panels, which are strips of material perfectly positioned to pull your shoulders back and expand your chest. The panels are oriented in in specific patterns, similar to the sports taping techniques, developer and designer, Dr. Tim Brown, a sports chiropractor, specializes in. The shirt design works because it places the body in the correct biomechanical posture–shoulders back, chest expanded, core tightened and compressed. Postural misalignments and muscular imbalances are what often cause overuse injuries–shoulder impingements, chronic neck pain and tightness, and even low back pain–so by helping the body structurally, and neurologically, the Intelliskin PostureCue Performance Apparel helps decrease injuries. But even better, by helping correct the dysfunctions, current injuries do not get exacerbated, and the body can go through an uninterrupted healing process. Sports chiropractors like myself know how difficult it is to keep athletes from playing through injuries. As a weekend warrior myself, I am no different from your average jock–I’ll only sit for so long. 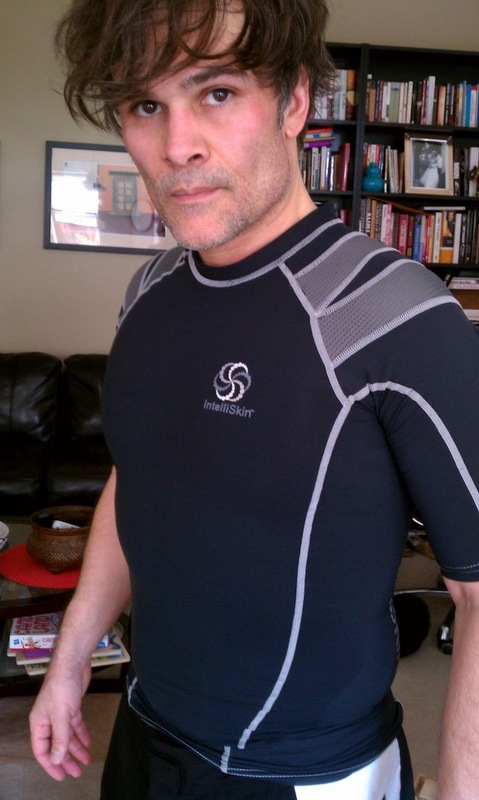 That’s why the Intelliskin was great for me, because I am going to do something…anything…as it’s my way of life. 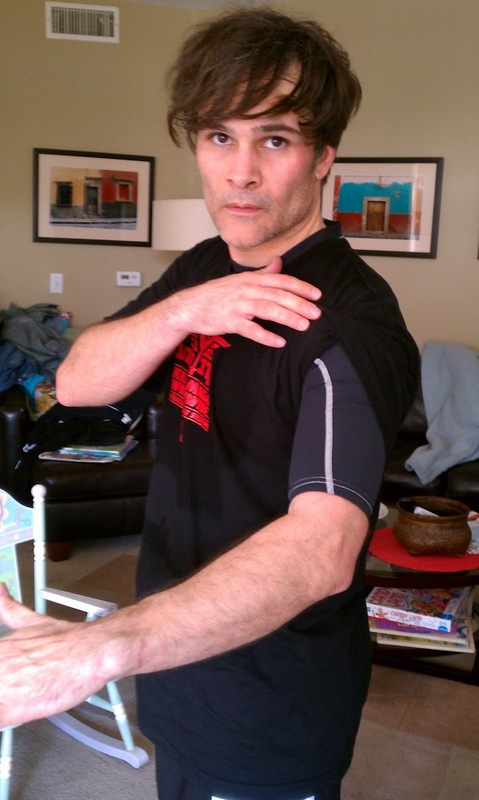 The Foundation 2.0 shirt helps my mechanics when I throw punches or any other upper body movement. Interestingly, when I first started wearing the shirt I noticed that I’d fatigue earlier, which means I was using muscles that had gotten lazy leading to muscular imbalance. The beauty is that the small stabilizer muscles needing to work during my sport were engaged, fatiguing earlier, yes, but developing along the way. This means the fatigue will not last long as the muscles become conditioned. The increased heat takes a little getting used to, but as the body is the great adapter, it will over time. Like I said, I love this product. And I recommend it for athletes or anybody trying to heal an injury. Intelliskin has women’s products as well, including a sports bra; and it has its LC-1 Reactivator shorts for lower back and pelvic stability. Check out Intelliskin and get your shirts, shorts and sports bras today–you’ll play longer, and better, in Intelliskin. No secret that I am anti-soft drinks. Funny because I am not much anti-anything, believe it or not. But I don’t like sodas–not for me, not for my children, and not for others. It’s garbage. Liquid sugar. No nutritional value whatsoever. Ten teaspoons of sugar per can…need I go on? 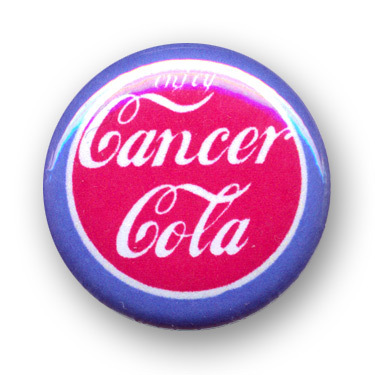 Well, it appears as if Coke and Pepsi also contain a cancer causing ingredient, one that I know at least I was unaware of, called 4-methylimidazole (4-MEI), a major component of the caramel coloring the sodas sports. 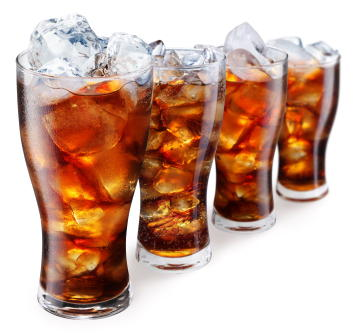 According to recent statements, Coca-Cola and PepsiCo have decided to lower the amount of 4-MEI in their soft drinks to comply with California standards that relate to findings that high levels of the chemical are shown to cause cancer in laboratory rats. Nice. Not that either company actually cares about the health and safety of their customers, but they would have had to place a warning label on their liquid sugar product which discloses that it contains a known carcinogen. And what do you think that might have done to sales? 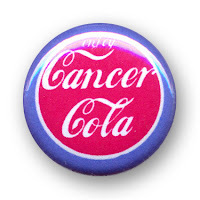 Both companies are probably resting assuredly that very few of their addicted consumers will ever find out about the cancer causing agent that has been a part of their drinks for decades. Indeed both companies assure shareholders that the changes will go unnoticed by addicts (and those not reading this blog). “We are NOT changing our recipe; or our formula,” Coca-Cola Company spokesman Ben Sheidler told AFP in an email. No just the toxic coloring. Bravo liquid sugar manufacturers. California voters passed Proposition 65 in 1986, and the law aims to protect state residents from “chemicals known to cause cancer, birth defects or other reproductive harm, and to inform citizens about exposures to such chemicals.” 4-MEI was listed as a known carcinogen under Prop 65 in 2011. Now mind you, both Coca-Cola and PepsiCo deny any health risk whatsoever, despite their products containing up to five times more 4-MEI than California standards. And not without a fight: The companies actually lost a battle against the state of California that dragged on for three years. The soda manufacturer’s argument: Trace amounts of 4-MEI are not sufficient to cause cancer in people. So let me get this straight. California has found 4-MEI–a compound used as caramel coloring, not just in soda but in soy sauce, coffee, bread, molasses, gravy and some beers–to be a carcinogen. And these companies have wasted time and money fighting on the grounds that, “It’s just a little cancer causing…and only in lab rats.” Yes, rats are always catching cancer in the lab…dumb rodents. That has nothing to do with you or me. Listen up liquid sugar pushers: You know damn well that if the public ever found out that you have a known carcinogen in your product, even if in just trace amounts, not one person would buy it. Not one. That’s why you caved in, because you would have been forced to label it, and there’d go your cash cow. Like I’ve said before, I’m a capitalist to the core, but providing a product that has a questionable ingredient, and then trying to be deceitful about it–and that’s what non-disclosure is, deceitful–is atrocious. You can minimize the issue all you want to, but you know that justice is often carried out in the marketplace. And your response speaks volumes. I’ve recently shown you a great beginners stretch for the quadratus lumborum (QL), which is an oft overlooked cause of low back pain. 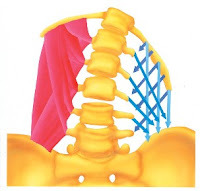 When this muscle gets tight it can mimic some of the more severe causes of low back pain, and thus many experts, myself included, believe that a number of “failed low back surgeries” might be due to conditions of the QLs. So what to do? First, it’s crucial that you visit a sports chiropractor. If you are in West Hollywood, you can call my chiropractic office, and I will evaluate the source of your low back pain. You may need a chiropractic adjustment to your lumbar spine, sacrum or pelvis, as each is factor contributing to low back pain. And if your QLs are tight, then you will need to stretch. Watch the beginners’ QL stretch video here, and if you do not feel like you are getting a sufficient stretch, then try the more advanced low back pain stretches that I demonstrate in the video below. Remember that the QLs are for side bending among other actions, so the advanced stretch is essentially a side bender. Be mindful of your form, as is true with all exercises and stretches, and remember to roll your body back slightly as you stretch, and you should get great results. Low back pain is never fun, but what complicates things and makes it harder to get relief is not understanding the source of the pain. So, again, get in to see your West Hollywood sports chiropractor for your low back pain relief, exercises and stretches right away. That’s the best way to get back on your feet quickly and feeling good again. This post isn’t really about ski racing, although it could be. Since I don’t know all that much about the sport, I won’t bore you with my version of its details. No this post is about something else that has caught my attention and has inspired me. A friend recently posted the video below onto facebook (thank you Tim V), and as I watched I observed the sports rehabilitative work that I am so familiar with because I do it everyday. Then I got to hear the words from the engaging athlete in the piece, and I became even more inspired. So this post is about something that gets my hairs standing on end. Hope you enjoy it too. Resi Stiegler is a World Cup alpine ski racer from Wyoming and the daughter of Olympic champion Josef “Pepi” Stiegler of Austria. Forget that she is a member of my blood tribe, as my mother hails from Klagenfurt, Austria, but what she is striving to achieve, and what she must bounce back from to do it, including the path she’s taking to get there, are all sources of intrigue for me. If you watch the video, you’ll see that Stiegler had a serious ski injury–leg fractures and ligament tears–laying her up for some time. 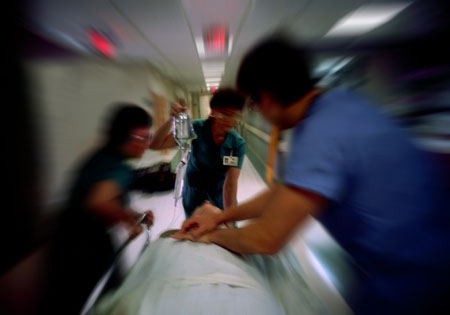 Recall my recent article on rehabbing my friend from a major motorcycle accident. Unlike Stiegler, my friend had no ligament tears, yet the rehab was still a challenge. The skier, on the other hand, had a number of physical obstacles that she had to address in her rehab protocol, making it that much more challenging. What really grabbed me about this video is the work Stiegler was doing to stimulate her proprioceptive system–a must in any sports rehabilitation program. Additionally she was challenging her stabilizer muscles by using the exercise ball, practicing yoga (although she makes no mention of it, she is doing a yoga asana in the video), and doing balance work with the additional challenge of playing catch with a medicine ball. She also mentions active release technique (ART), a powerful muscle treatment utilized by chiropractors and physical therapists. 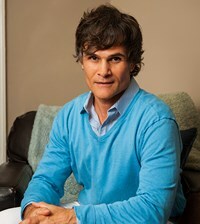 In my sports chiropractic practice, Stiegler would have also received a boost from regular chiropractic adjustments. But her program seems to have worked wonders. Each one of the practices described above is powerful and were all likely contributors to her amazing comeback. 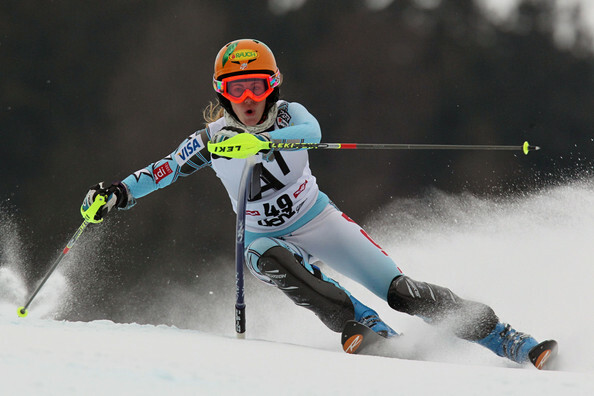 Stiegler placed second in the World Cup slalom in Ofterschwang, Germany on Sunday–a career best for her. Watch the video to see what gets me inspired about the world of sports rehabilitation (and please note some of the things she talks about at the end of the clip, which illustrates the crucial mental component, although she doesn’t talk about it in that way…she’s just living it). 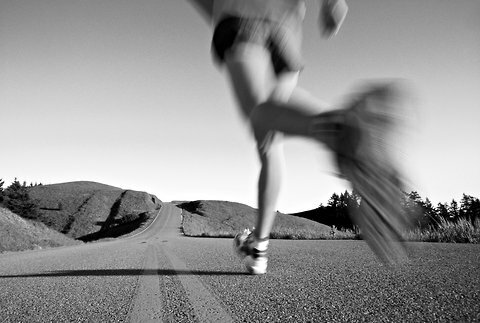 Bringing world-class athletes back from injury and competing again is a fulfillment to me like no other. And helping everyday folk get back to playing with their children, being productive at their jobs, and competing in their own hobbies is no less fulfilling. Watch the video to see what I love. 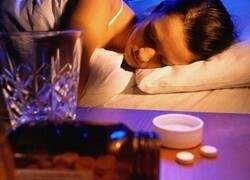 Bad news for seekers of sleep-help: Sleeping pills increase the risk of death, and the risk of developing cancer. A new study discloses that regular users of sleeping pills are four more times likely to die than people who don’t take them, not a good thing considering 5-10% of the U.S. adult population is said to be taking pharmaceutical sleep aids. Sleeping pills that were linked to these risks included benzodiazepines such as temazepam or Xanax; non-benzodiazepines such as Ambien (zolpidem), Lunesta (eszopiclone) and Sonata (zaleplon); barbiturates; and sedative antihistamines. According to the study, which looked at over 10,500 people, people who were prescribed up to 18 doses of sleeping pills a year were 3.6 times more likely to die than their counterparts who were prescribed none. And those prescribed between 18-132 doses were more than four times as likely to die. People taking more than 132 doses a year had five times the risk of dying compared to those prescribed none. This was true regardless of age, but risks were highest among those individuals aged 18 to 55. Dang! To add insult to injury, those people taking the highest doses of sleeping pills had the highest risk of developing cancers, including those of the esophagus, white blood cells, lung, colon and prostate. Although many potential explanations exist for the increases in cancers, preexisting health conditions was not one of them, leading one to conclude that the association to sleeping pills is meaningful. Saying that, causation was not found in this study, only that there was an association between taking sleeping pills and increased cancers and death. In other words, it is not definite that the cancers and deaths were caused by the sleeping pills themselves. Equally likely is that people on the verge of either illness or death might have a disrupted enough sleep to warrant help. 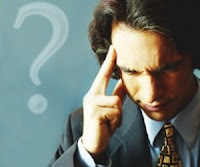 In fact, sleep problems are often the first to appear in medical or psychological conditions. Good points and good advice from both doctors. Here’s the bottom line: Sleeping pills, like all drugs, have their usefulness. Chronic use, however, is a problem. If you need sleep aids to fall asleep most nights, then something else is going on. And let’s not forget how habit forming these drugs can be–the more you take, the more you gotta take, an so on. If you are having problems sleeping, do what the good doctor Forni suggests: exercise, eat well, reduce caffeine, avoid naps…but most importantly, keep a rhythm. Nothing in my books leads to sleep disorders faster than an erratic sleep schedule. Do yourself a favor, focus on good sleep patterns and get the rest you need for healthy mind and body. And stay away from the sleeping pills–they’re killers. Well, well, well…didn’t I just say so? Looks like statins–those mega-popular cholesterol lowering drugs pushed by every general practitioner in existence–are getting new safety warnings about risks of memory loss and elevated blood sugar. You don’t say? Why yes, looks like the ol’ magic-bullet is being knocked down a notch or two, and with good reason. 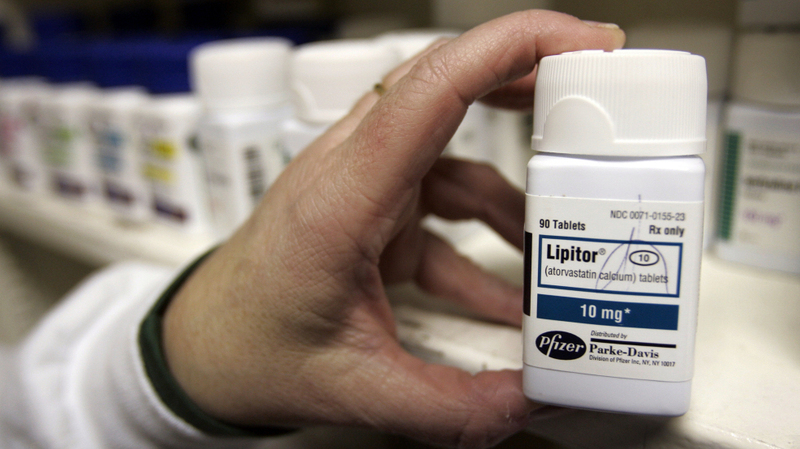 The Food and Drug Administration (FDA) reports that it’s making labeling changes to the statin drugs–like Lipitor, Crestor, and Zocor–that will warn of memory loss and confusion reported among certain patients taking statins. 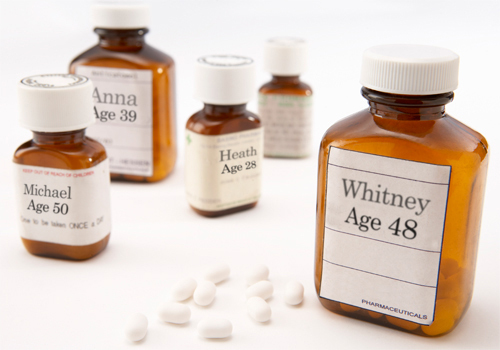 Although the feds reassure us that the brain effects are not permanent–apparently going away with discontinuation of the drug–still they find it best to label the drugs to warn us of the potential for waking up in Niagara Falls with no recollection of how we got there. Doh! Further, the updated labels will also mention elevated levels of blood sugar, associated with diabetes, that have been reported in some patients taking statins. Wait…early onset Alzheimer’s-like symptoms and diabetes?! Wow, get some right away…thanks doc. Yes, although the increased risk is small, an increasing number of studies is showing it’s there nonetheless. Cardiologists, however, are sticking to their guns, stating that the benefits of statins outweigh the risks. 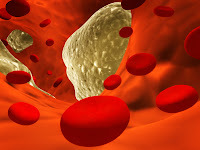 “Patients should not see this as a new danger with the drugs, but as a known abnormality that appears in blood testing and should be discussed with their doctor,” said Dr. Kevin Marzo, chief of cardiology at Winthrop-University Hospital in New York. He goes on to say that he doesn’t see the new warnings making much of a dent in how (read: how much) the drugs are prescribed. 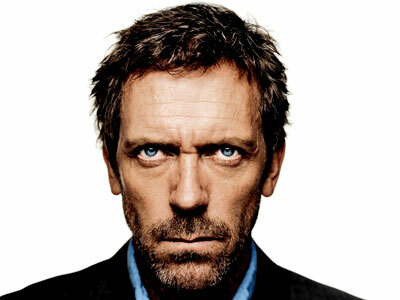 Okay well this much we can assume, doctor; but let me paint a more complete picture for the generally trusting public. What cardiologists mean when they say “the benefits of statins outweigh the risks” pertains to a certain demographic, in reality a minuscule fraction of the tens of millions that are currently taking the drugs. Remember from a 2008 post on statins, the number needed to treat (NNT) for even one person to receive benefit from statins is 100. So in other words, for every person receiving benefit, 99 do not; or in bigger numbers: 9.9 million of every 10 million people on statins gets NO BENEFIT! What cardiologists assume (and for some people correctly) is that many patients will do nothing. But that’s not you, right? No need to assume the risks associated with statins. 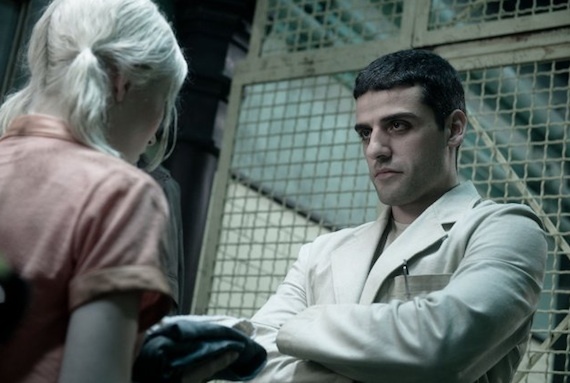 Do the right things and you won’t have to, no matter how much your medical drug dealer pushes.